If only there was a way to organize it better. I gave this lots and lots of thought. I searched for spice bottles and found lots of them. The most readily available ones had a cheap, plastic lid that I know I would have broken very quickly. I then found some plain ones that I really liked, but I could only find three of them. I bought all they had! 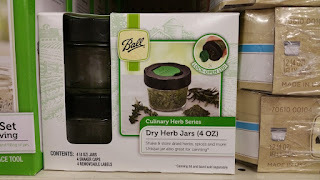 I also picked up some plastic lids for the jars I had began to collect from the thrift stores. 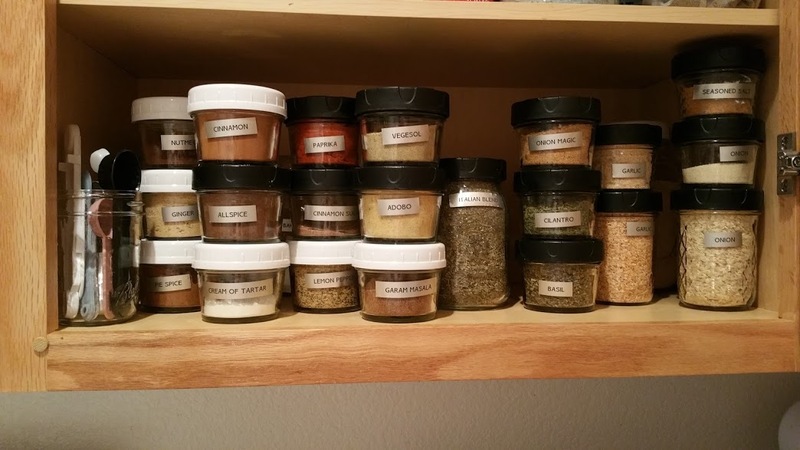 After cleaning all the jars and lids, I was ready to transfer all my spices to their new containers. I'm very happy with the results! Notice the little jar of spoons in the bottom left corner of the photo above? 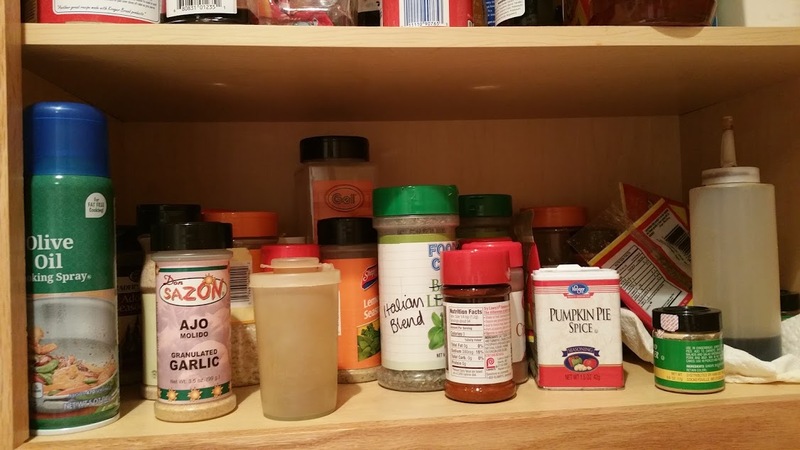 I will use those little spoons to spoon out the spices or I will pour a little into my hand before I put them in whatever I am cooking up. I don't normally have so much garlic salt, but I bought a large container of it, then mixed in a lot more garlic powder, so I ended up with a lot of it. 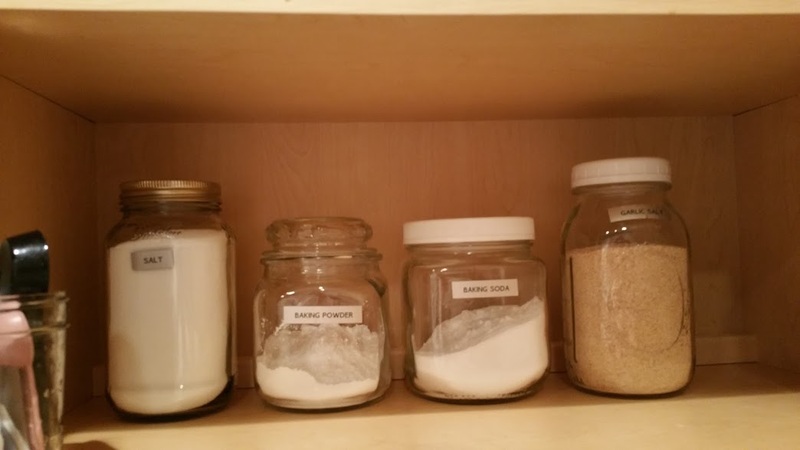 Where can you find mini mason jars? I found them at almost every grocery store I went to and at the hardware store (who knew?)! And, of course, the thrift stores have jars of all sizes. A can of pumpkin had been hanging around my pantry. I love pumpkin and am always looking for new ways to use it. 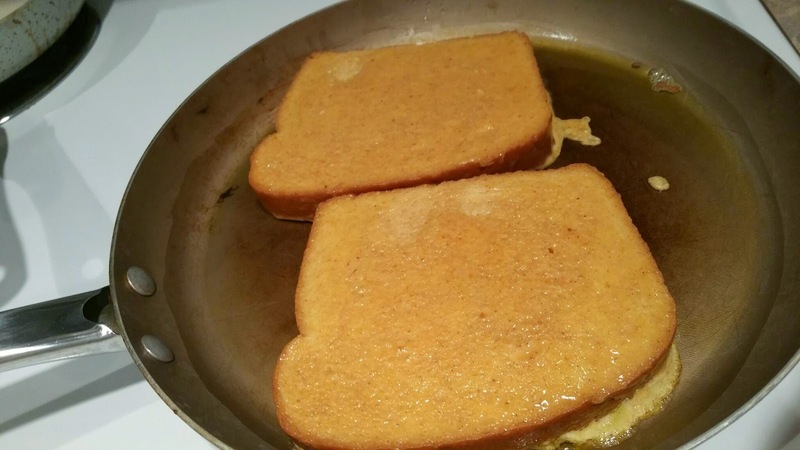 Today's experiment is Pumpkin French Toast. 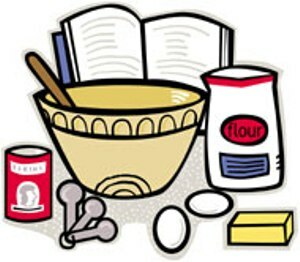 Whisk all ingredients together, except bread and oil. 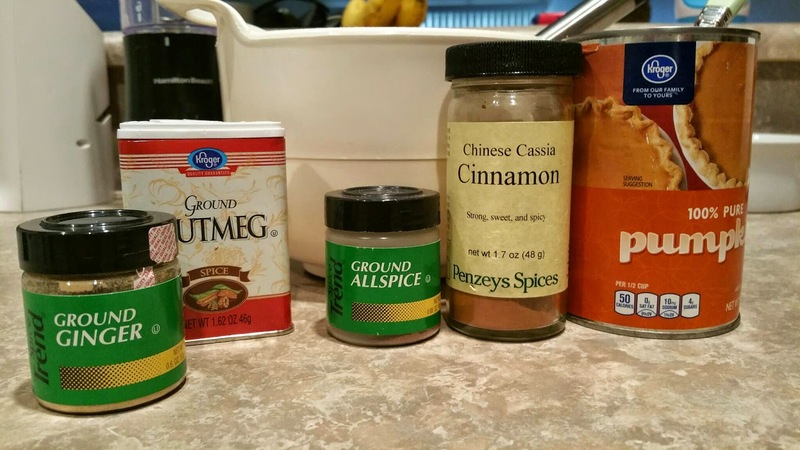 Add the spices and brown sugar to your taste. I probably put about 1 teaspoon of each. Dip bread in egg mixture and fry in pan with a little hot oil. Cook on medium heat until brown, flip and cook until brown again. It was delicious! 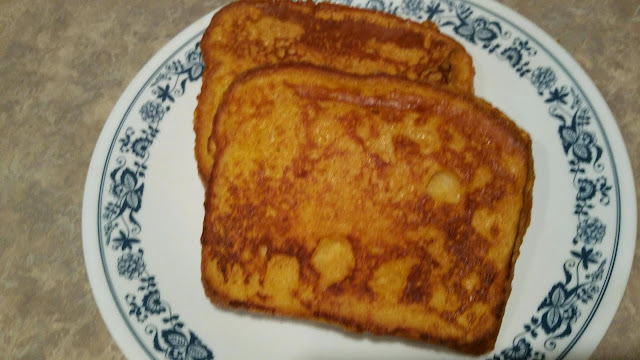 French Toast that tasted a little like pumpkin pie! Yum! 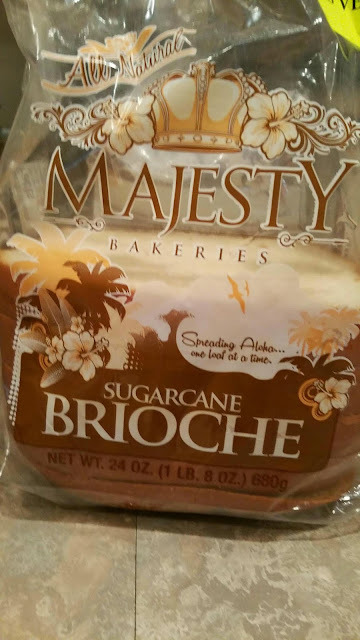 I don't enjoy syrup, so I just put a little butter on the bread and ate it plain. 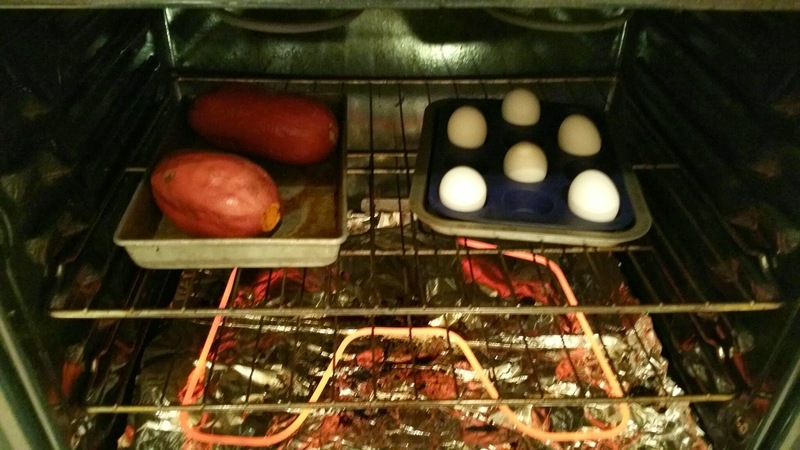 One of my favorite ways to hard boil an egg is to bake it in the oven! Bake eggs for 30 minutes at 325 degrees. 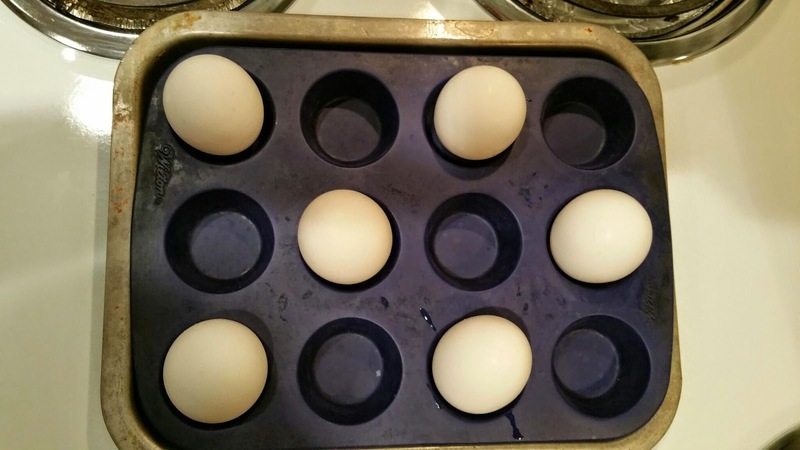 I like to use my mini-muffin pan to stabilize the eggs. On this day, I was baking sweet potatoes at the same time, so putting the eggs in saved some energy. 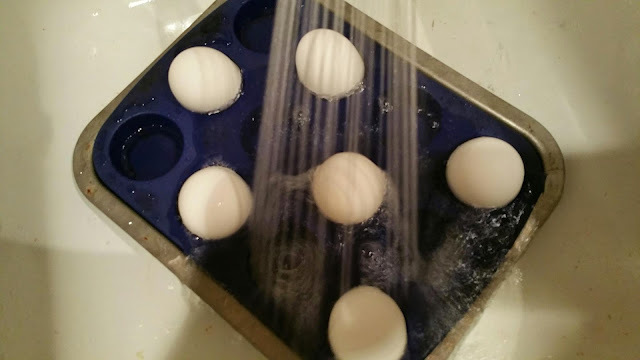 When the eggs were done baking, I gave them a cold-water shower to stop the cooking process. I find the eggs peel easier when baked vs. boiled. 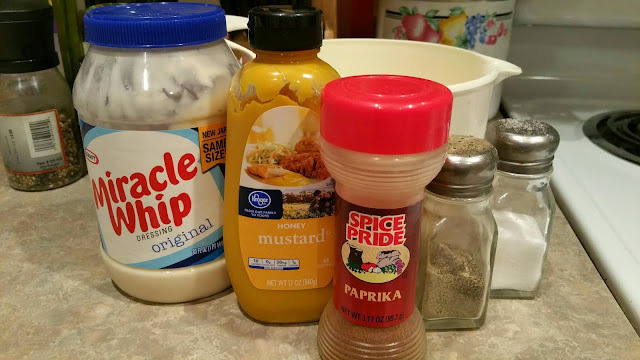 Egg Salad Ingredients: Eggs, Miracle Whip, honey mustard, salt, pepper, and a dash of paprika. 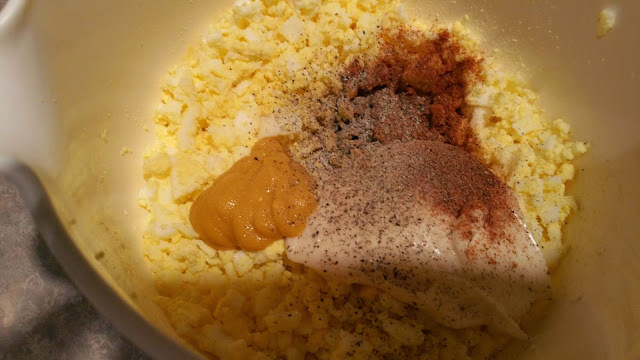 I find using a pastry blender is the perfect way to dice the boiled eggs. Add the ingredients and stir. I never measure anything, just add what feels right. It was gone so fast, I didn't get a finished photo. It was delicious! 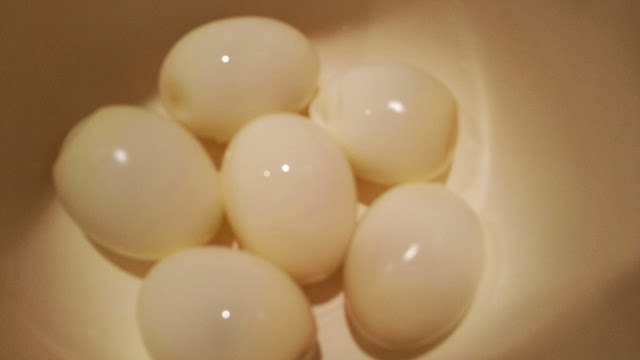 Will you try baking your hard-boiled eggs next time? 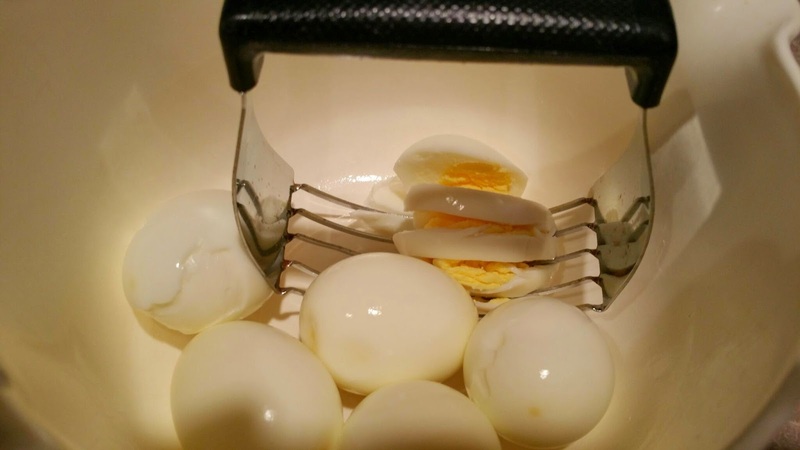 This is a great way to cook many eggs at once, like at Easter time or for a big crowd. This easy dish reminds me a little of Chicken and Dumplings. I get paid every-other week, therefore I shop every-other week now, instead of weekly. It is sort of nice to shop and cook one weekend, then use the next weekend for other activities. Sometimes, I break up the cooking by cooking some items one weekend and a few other items the next. These are great for lunch paired with fruit or a salad. I freeze them in 1-portion snack baggies. Back To Cooking Leftovers On Purpose! After adventure and life changes, I'm ready to get back to blogging. In late 2011 I stopped blogging when I made a life change and closed our home child care after 13 years. It was bittersweet as I miss the families I served, but 13 years of changing diapers is enough for anyone!